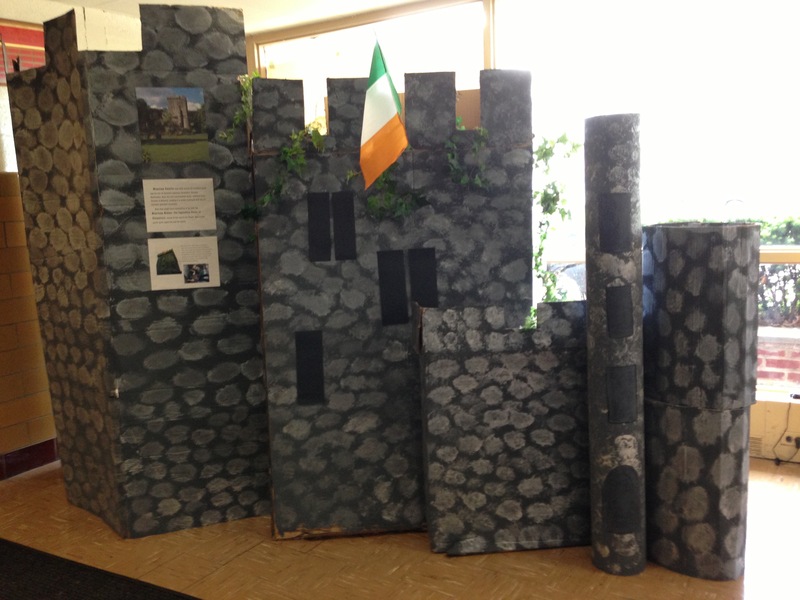 A few years ago at my kids’ elementary school we celebrated Ireland for our annual International Day. I had the pleasure of co-chairing the event with my friend Lisa. The goal was of course to teach the children about Ireland, but our approach was to cover all their senses. If it wasn’t a fire hazard I would have had peat burning! In the morning as the children approached the school, they could hear the sound of bagpipes. One of the school’s own alumni, a boy named Patrick, was playing the bagpipes to greet the students. The Irish flag hung in the school’s foyer. The school day started with local Irish poet Connie Roberts giving the morning announcement over the loud speaker, and reading an Irish poem. The landscape of Ireland is one of it’s greatest features. We covered the hallways with photos of the beautiful landscapes. Classes took turns taking a “walking tour of Ireland” – looking at the photos, reading and learning about what was pictured. Other things that were visually represented included the painted doors of Dublin, and the different sports in Ireland (soccer, hurley, etc.). A glass cabinet contained things from Ireland – sweaters, tea pots, crystal, an Irish cap, a shillelagh, etc. “Decorate a sheep for International Day – Ireland. Use any material (cotton balls, pipe cleaners, paint, etc.). Be creative! Farmers often mark their sheep with a colored dot, so they know which sheep is theirs. How will you mark your sheep? Fun Fact: There are approximately 8 million sheep in Ireland!” One wall of the school was filled with the students’ sheep – grazing in a green field of course. My friend Lisa planned the event of the day. All the kids gathered in the gym and watched an amazing performance by Schade Academy of Irish Dance, a local Irish step dancing school. The dancers were fabulous, even the very, very youngest. Their traditional Irish step dancing outfits were beautiful! In the afternoon we visited the classrooms serving tea. Unfortunately hot tea was vetoed – they didn’t want anyone getting burned – but the kids got the idea. The printable book contains six coloring sheets. 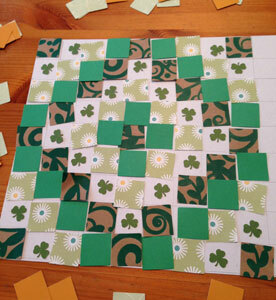 Fold them and create your own book about Ireland! I’d love to hear the creative ways you teach your kids about Ireland! Comment below. Categories: how to, Inspiration | Tags: activities, class lesson, ideas, ireland, kids, lesson plan, school activities, St. Patrick's Day, teaching, teaching kids about Ireland | Permalink. These printable coloring sheets are available individually or order the printable book which contains several sheets together. Fold them and create your own book about Ireland! Categories: Creating Products | Tags: activity, children, coloring, coloring book, elementary, ireland, Ireland lesson, Irish, lesson plan, school, St. Patrick's Day | Permalink. Cue the bagpipes. Let’s get ready for St. Patrick’s Day! Order St. Patrick’s Day flair in my Zazzle shop! Create an Irish Blessing sign with this free downloadable pdf and transfer tips. Categories: invitations, Signs | Tags: Flair, Irish pins, leprechaun, Leprechaun clipart, Pot of gold clipart, Shamrock clipart, St. Patrick's Day, St. Patrick’s day pins | Permalink. I’m proud to be Irish and like to wear green on St. Patrick’s Day and decorate the house to celebrate. My new leprechaun illustration is available on hats, T-shirt’s, and pins in my Zazzle shop! Create an Irish Blessing sign with a downloadable pdf in this blog post. The blog post includes tips on transferring the poem to a wooden surface. Categories: Illustration | Tags: Flair, free download, Irish poem, leprechaun, pin, Proud to be Irish, sign, St. Patrick's Day | Permalink. It amazes me how different the weather in NY can be on St. Patrick’s Day. One St. Patrick’s Day years ago, before kids, it was a warm, blue sky, beautiful day in New York City. I said to myself, “I will never work on St. Patrick’s Day again. I should be at the parade.” The next year, I took off, and as I headed to the parade it was snowing. This year there are blue skies – but it is very cold! 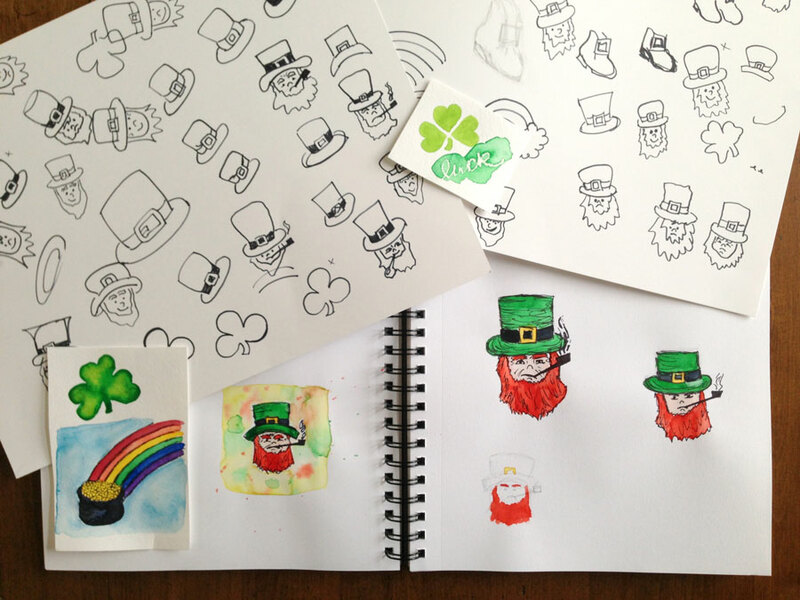 These illustrations are from the year I did a 17 day St. Patrick’s Day countdown. I created an illustration each day. These days I’m working on my beach painting project. P.S. – The second issue of my new newsletter My Creative Collection went out today. It’s a collection of what is inspiring me – in hopes of inspiring you! Learn more here. Sign up here. Categories: Inspiration | Tags: Happy St. Patrick's Day, Irish, St. Patrick, St. Patrick's Day, St. Patrick's Day illustration | Permalink. For the last couple of weeks, I’ve been creating illustrations for St. Patrick’s Day and posting to Instagram. For each idea I have, I draw/paint multiple versions to see which one I like the best. It dawned on me, the it isn’t just hand-lettering that takes “Practice, practice, practice.” I have to draw several “takes” before I create an illustration that I like. I also take pictures along the way to see how the illustration will look when it’s finished, and to make sure I like the background and how it fits in the shot. This way of working is new to me. In the past, I’d sit down to create a painting, and try to make it work. I began working in this way since starting my themed postings (first Valentine’s Day, then St. Patrick’s Day). I doodle, I paint, I plan in pencil. I try again. I wouldn’t say it’s about getting it perfect, it’s more about warming up and trying different things. I really enjoy following one theme. The first couple of days are easy. After that, there is the period where I’m like, “What am I going to do now?” In both cases, the more creative ideas came to me towards the end of the campaign. I guess it’s the time when I dig a little deeper. All the obvious ideas are out of the way, so I have to think harder. 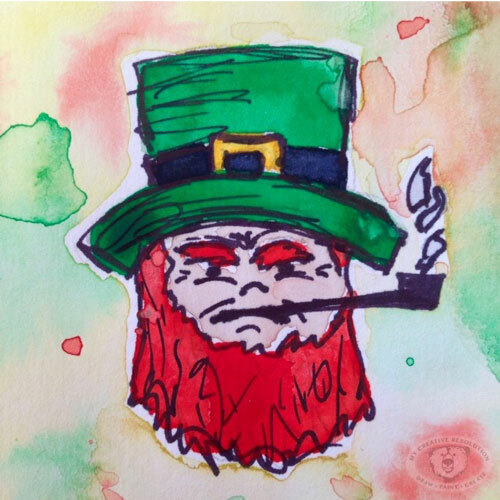 Categories: Illustration | Tags: Art, Drawing, illustration, ink, Irish, leprechaun, painting, Sketch, sketchbook, St. Patrick's Day, watercolor | Permalink. Happy March! Time to pull out your green! I’m planning another Instagram art series and I’d like you to join in the fun! The theme is St. Patrick’s Day. Include #mcrstpatricksday in your Instagram post. Join me for a day or all 17 days (March 1 – 17th). It will be fun! I had a great time last month posting Valentine’s Day art for 14 days. Working within the same theme was really interesting. You really explore the theme as the days go by, and you come up with different ideas. I used several different mediums: watercolor, watercolor and ink, scanned doodles from my sketchbook and painted them in Photoshop, created a pattern, and a linocut. 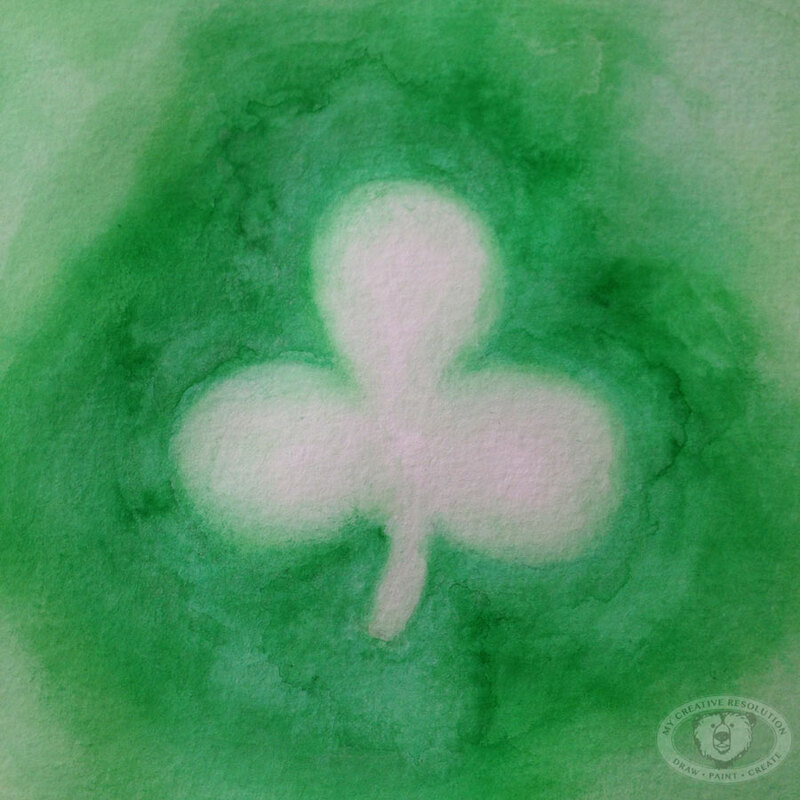 Categories: Inspiration, Uncategorized | Tags: Art, Drawing, illustration, ink, ireland, Irish, painting, shamrock, St. Patrick's Day, watercolor | Permalink. 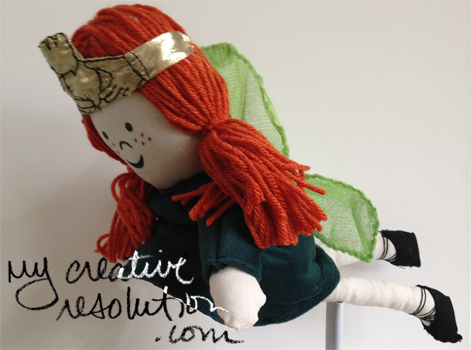 My Claddagh Fairy illustration made into a doll! Happy St. Patrick’s Day! 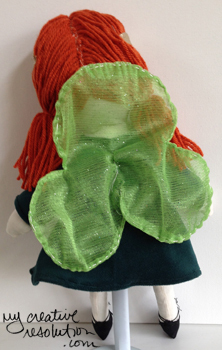 I am so happy today (in honor of St. Patrick’s Day) to bring you the doll version of my Claddagh Fairy. 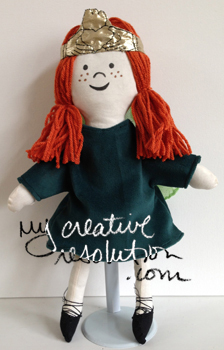 All thanks to my niece, Ryan, my illustration has come to life – in doll form! Thank you Ryan! See more illustrations from the Claddagh Fairy and my journey to develop a children’s book illustration style. The Claddagh Fairy is copyrighted. Unauthorized use of this blog’s content, text and artwork is prohibited. 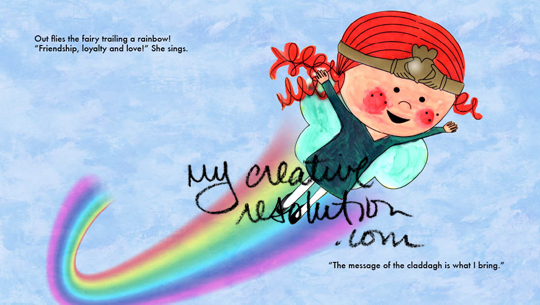 Re-blogging and/or sharing links is allowed provided that http://www.mycreativeresolution.com is credited and a direct link to the original content is included. Thank you. Categories: Illustration | Tags: children's book, children's illustration, claddagh, claddagh doll, claddagh fairy, claddagh ring, doll, fairy, illustration, Irish Doll, irish fairy, St. Patrick's Day, St. Patrick's Day craft | Permalink. Ah it’s March. Spring will be here soon, and warm weather I hope! St. Patrick’s Day is also around the corner. I love decorating the mantle in my family room for the season/holiday. This year, I added to my mantle a couple of homemade projects. You may remember my Irish Blessing sign, created using a Citrasolv transfer technique. 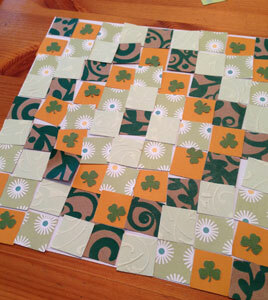 Recently, I created my first paper quilt, in a green “Irish” theme, which was a fun and easy project. I’m looking forward to creating a “beachy” themed one soon. I also hung a couple of our family crests. I was inspired by “Game of Thrones.” In the books, each family has a banner representing their “house.” Symbols on the banners include a lion, wolf, fiery heart and even an onion. I found our crests online and wrote the family names on the back. I thought it would be fun for the kids to flip them over, to find out the names. Surprisingly the kids have never heard of the family names a few generations back. In addition to these homemade elements, I grabbed every green candle I had! I also hung two leprechauns that I had with my Christmas ornaments. I hung a string of shamrocks with the family crests. I added my son’s school project – a rainbow over a pot of gold. I love including the kid’s projects with my decorations. I thought the Celtic cross and the Belleek vase were nice “authentic” additions. I used fake greenery, since I wasn’t able to find any shamrocks! 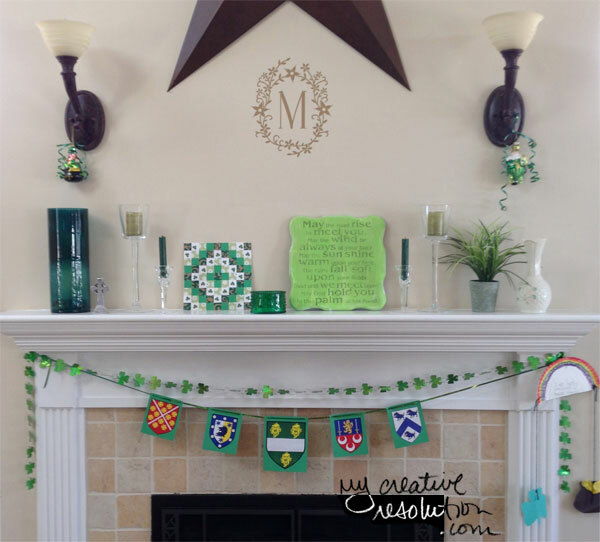 Categories: Home | Tags: Irish, Irish decorations, Irish mantle, mantle, St. Patrick's Day, St. Patrick's Day craft, St. Patrick's Day decoration, St. Patrick's Day DIY decoration, St. Patrick's Day mantle | Permalink. Paper Quilt – No sewing required! When I saw a paper quilt on the Country Living magazine website (from Linda & Harriett – see links below), I knew I had to make one. 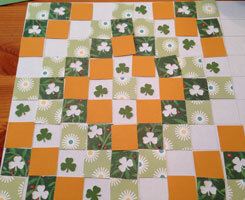 I have always wanted to make a quilt, but I can’t sew! I wanted to go to the craft store and get paper, but it was pouring out, so I decided to use what I had, including pieces of a gift bag. The Country Living quilt calls for 2″ squares of paper in 4 different styles (20 squares of 3 styles, 21 squares of 1 style). 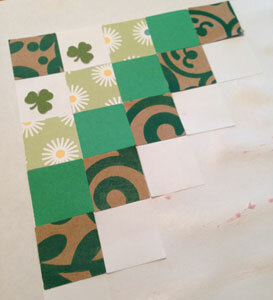 I have a 1″ square punch, so I decided to use that and make my quilt with 1″ squares. I drew out a grid of 9 rows and 9 columns, so I could plan my design and play with different paper options. Since I was unsure of which papers to use, I decided to follow the Country Living design. I wanted to use mostly greens, because St. Patrick’s Day is around the corner. I selected 4 paper styles and punched out my squares. I also punched out shamrocks. I placed the squares on the grid, following the Country Living design. I took a photo and swapped out one of the papers. I tried a couple of options, taking photos of each one, so I could compare. I decided to go with the last option I tried. Since the grid I drew wasn’t perfect, I got a new piece of paper to glue the squares on. Using a glue stick, I started in the corner, using the edges of the paper as a guide to keep everything as even as possible. After it was done, I trimmed off the unused paper. I mounted my quilt on a piece of card stock. I couldn’t be happier with the results! It is going on my mantle! What a fun project. Order some St. Patrick’s Day flair in my Zazzle shop! Create an Irish Blessing sign with this downloadable pdf and transfer tips. 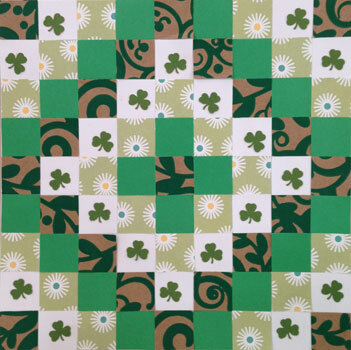 Categories: Craft | Tags: craft, paper, paper quilt, St. Patrick's Day, St. Patrick's Day craft, St. Patrick's Day DIY decoration | Permalink.